Satya Narayan Goenka (January 30, 1924 – September 29, 2013) was a Burmese-Indian teacher of Vipassanā meditation. In 1969, he shifted to India and started teaching meditation. In time, he became an influential non-sectarian teacher of the Vipassana movement and a pioneer of the Vipassana meditation in India. He trained more than 800 assistant teachers and each year more than 100,000 people attend Goenka led Vipassana courses. The technique which S. N.Goenka teaches represents a tradition that is traced back to the Buddha. 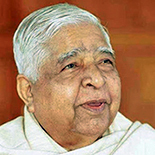 Goenka emphasizes that, “The Buddha never taught a sectarian religion; he taught Dhamma – the way to liberation – which is universal” and presents his teachings as non-sectarian and open to people of all faiths or no faith. “Liberation” in this context means freedom from impurities of mind and, as a result of the process of cultivating a pure mind, freedom from suffering. Goenka calls Vipassana meditation an experiential scientific practice, through which one can observe the constantly changing nature of the mind and body at the deepest level, a profound understanding that leads to a truly happy and peaceful life. He was awarded the Padma Bhushan by the Government of India in 2012 for social work.